A welcome development this year in the Elementary School at KIST has been an emphasis on inquiry. It is more than likely due to feedback from our recent IB re-authorization visit and for me, an opportunity to grow in one of the most challenging aspects of teaching. I’ve blogged quite a bit about the theory and practices of inquiry learning, most recently in the post, CLMOOC Unmake: Unintroducing inquiry learning. When it was announced that inquiry would be a focus, I sifted through articles I had read and collected over the years. The people who do most of the talking in class do most of the learning. Unfortunately, a bunch of teachers will do a lot of learning today. I also enjoyed gliding over memory lane and revisiting some saved tweets with choice perspectives on inquiry. One article that grabbed my attention last autumn was Good research starts with good questions by David Farkas and Brad Nunnally. What I found most interesting was that many of the pitfalls of research questions are actually key techniques in developing questions for inquiry learning. For example, research should avoid ‘leading questions’ that may skew data in a particular direction. In teaching, we want the learners to find their ways to a common destination, either general or specific. In an occurrence I wish were more common, while reflecting on the experience, a colleague commented that one challenge inquiry teachers face is the desire of students to ‘get the right answers’, or even worse, to answer in the way they believe the teacher wants. This can lead to regurgitated prior knowledge answers rather than creative explorations of the concepts and contexts presented in the questions. In Grant Wiggins’ article, 5 Tips To Help Students Arrive At Their Own Understandings, the distinction between Understanding and Knowledge is highlighted. It’s vital that learning in an inquiry setting begin with as close to a clean slate as possible. The more a class feels that their teacher is soliciting a ‘right’ answer, the less likely they are to develop deeper and personal understanding. One solution to the problem is to ask students to generate questions based on elements of the understandings we wish them to pursue. In an IB PYP unit of inquiry, the ‘lines of inquiry’ should help to define the scope of an intended inquiry, while the ‘key concepts’ provide a frame or lens through which to interpret one’s findings. 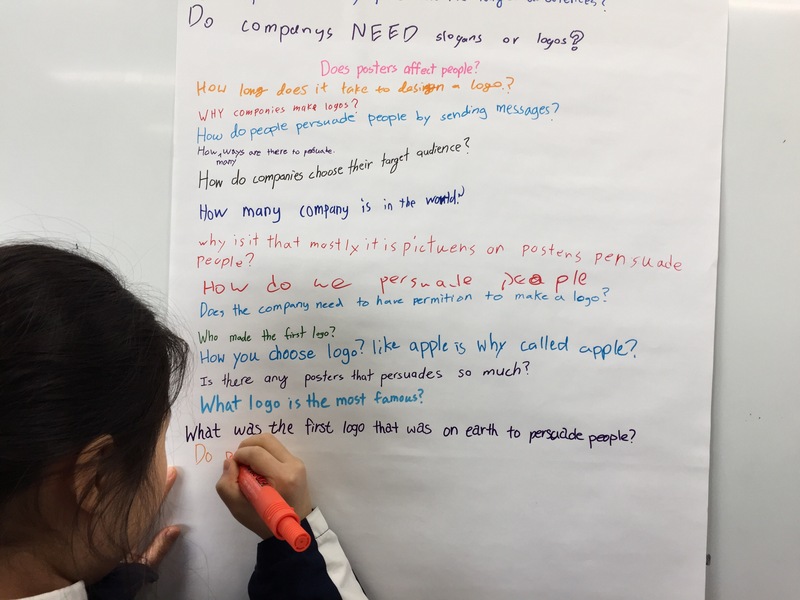 The photo above is a list of questions generated by a provocation in which students identified company logos, then considered them in reference to the line of inquiry, ‘How images, text, and music are used to influence people’s choices’. This year, we are collaborating with another grade level team to develop questions together to provoke inquiry into a new unit. The initial concept was to begin with carefully selected materials and a starting question intended to stimulate creativity and curiosity. Subsequent questions would climb the Bloom’s Taxonomy ladder to higher-order thinking skills, as well as ‘funnel’ students’ understandings in the general direction prescribed by the Central Idea and Key Concepts of the unit. Our first meeting was to develop questions for the other grade’s lesson. Then, we observed them and followed up with a debriefing session, and to develop questions for our lesson. They attended our lesson and we concluded the collaboration with a final debriefing about the entire experience. The process reinforced my belief in the importance of collaboration and design thinking in Learning Experience Design.